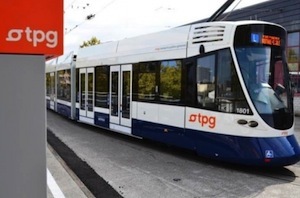 Back in September, transports publics genevois - tpg launched the first real-time open data API in Switzerland! This also marked the start of a close collaboration with Lift who helped gather momentum around tpg's open data challenge. Lift organised a series of workshops that brought together a rich mix of contributors from Geneva's Haute école d'art et de design - HEAD and Geneva University, as well as independant developpers and ICT service providers. In total, over 20 projects entered the competition of which 16 were scrutinised by jury members representing the transport industry, open data experts, the media and public sector observers. Abir Oreibi from Lift observed how "the launch of tpg's open data platform was a great opportunity for designers, developpers and industry experts to meet and leverage the potential that open data offers. The workshop discussions and exchanges brought some smart projects adding real value for the public transportation users. For example, Help Point addresses accessibility issues for people with permanent or temporary disabilities." The tpg open data community born out of this challenge is set to grow with regular meetings to discuss transport technologies. Congratulations to the winners, well done! And here is the link to all 16 projects.